Make sure your air conditioning and heating system is effective and long-lasting with the versatile ductwork products and accessories from Texas Duct Systems, L.L.C. Contact us to learn about the wide range of choices to fit virtually any project, large or small. While we are strictly a manufacturer and distributor, we can advise on your installation situation. Learn About Texas Duct Systems, L.L.C. 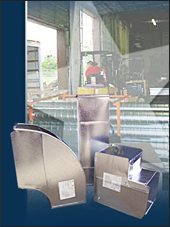 Make your project a success with ductwork manufacturing from Texas Duct Systems, L.L.C., in Houston, Texas. Our sheet metal fabrication is done primarily for commercial and industrial air conditioning systems. As the first shop in Houston dedicated solely to fabrication, we bring more than 35 years of experience to each job. Our family-owned-and-operated company offers manufacturing, estimating, detailing, and shop drawings for commercial and residential clients. We are strictly a fabricator and distributor, but we also have years of installation knowledge to assist in your specific application.